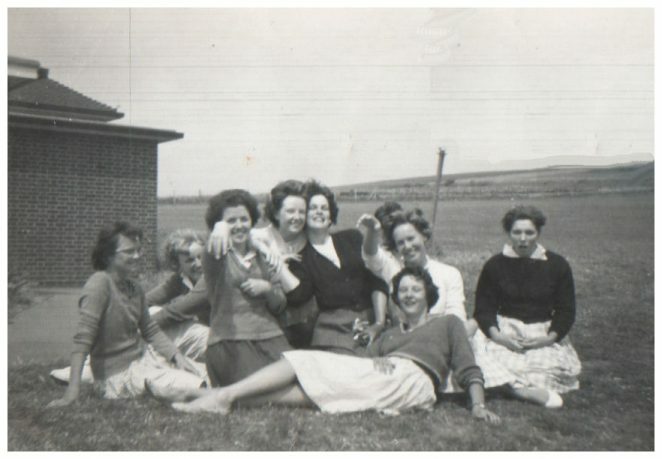 This photograph shows my ex-class mates at Mile Oak Secondary School for Girls 1959-61, during the pre nursing course; it was taken in the school field. The two definite identifications are Carol Dean 2nd back from left hand side. I am 4th at the back and 5th back is Julie Christmas. Possible other names Adrian 1st left and Mary lazing in the front. Can you recognise yourself or anyone else? If you can, please leave a comment below. Adrian Long, I will forward a link to this page to Julia Christmas as we have remained friends since forever. She will surely recall the nursing class girls, I opted for shorthand typing in the Lower Fifth for which I hated and dropped down to leave school at 15. I recall your name Angela. Hullo Bonny many thanks for answering my comment. Due to personal circumstances I have not visited the site since then, so was unaware of your reply. I hope all is well with you. Much has changed since those days but if Julie would like to contact me I will give you my E mail address but if not I understand. We did have fun. I travelled up from Ringmer, a village just the other side of Lewes every school day for two years for the pre-nursing course and wouldn’t have changed anything. Angela sorry I have only just gotten back to this page. Julie and I have met up a few times, and I have photos of our shared times. If you have FB I am on it as Bonny Cother, I have posted photos of Julie and myself in Atlanta while visiting her dear daughter Alison last year. Please keep in contact.